We live in an extremely competitive world, and parents these days want their kids to get ahead of the rest even from the womb itself, hence you see many of these “baby aids” that intend to help the development of the foetus in the market. 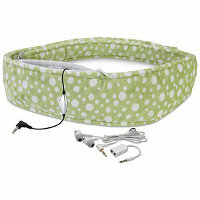 ThinkGeek does not want to get left behind as well, hence their $59.99 Lullabelly Maternity Musical Device, which is actually a pre-natal music belt which allows you to play tracks of your choice so that your future geek-to-be will also be able to rock on to today’s grooviest tunes without missing a beat. Not only is it super soft to make sure it does not mess up mummy’s tummy, it is also adjustable, lightweight and comfortable. The volume for baby’s speakers are capped at a safe level, so you need not worry about breeding a headbanger right from the get go. There is a splitter thrown into the mix for you to listen to the same music, and hopefully you won’t introduce him/her to Justin Bieber, but rather, more solid stuff like Smashing Pumpkins and Nirvana.